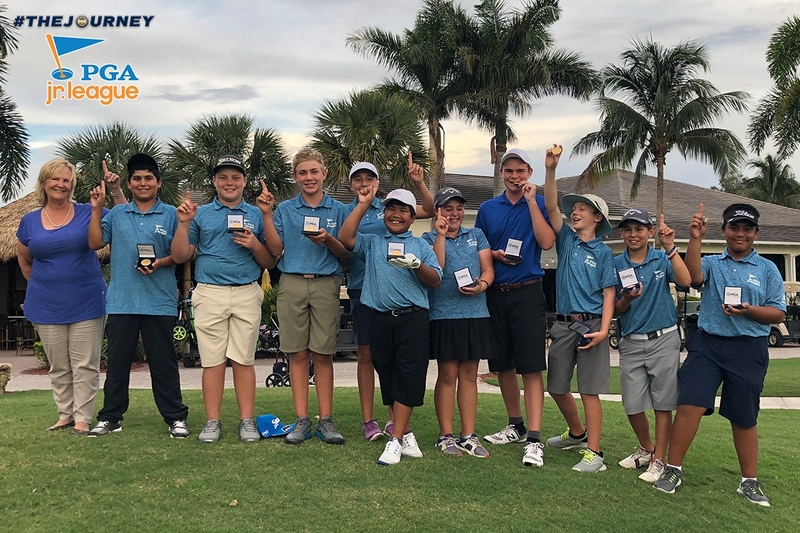 August 26th 2018 - Yesterday, the South Florida PGA held the PGA Jr. League Section Championship, presented by National Car Rental, at Turtle Creek Club. 40 junior golfers, forming 4 All-Star Teams, competed for a spot at the PGA Jr. League Regional Competition. Despite the rain and lightning storms the kids still managed to have fun and competed in standard PGA Jr. League match play. The format for PGA Jr. League is a two-person scramble-match play. Each match is 9 holes in length, broken into three 3-hole segments called “flags”. There are three flags per match. Flags are the key scoring component of your games. Each flag is worth one point. Each match is played for three points. The first match consisted of all 4 teams competing in this format. The Sandhill Crane team competed against the Palm Beach County Team while the Indian River Golf Foundation team competed against the Stoneybrook/Impact/Forest team. After a few storms and delays, the Palm Beach County and the IRGF teams came out on top and competed head to head in an afternoon match to determine the overall winner. The winner of the PGA Jr. League Section Championship was the Palm Beach County team. They will be competing at the Regional Competition at World Golf Village in St. Augustine, FL on September 22-23rd. The South Florida PGA is fortunate enough to hold the PGA Jr. League Section Qualifier and Championship. Throughout the summer, the South Florida PGA conducts multiple events for juniors of all ages. For more information on the South Florida PGA Junior Programs please visit the South Florida PGA Junior Tour website at www.sfpgajuniorgolf.com.